Probably the best dog ball in the world. 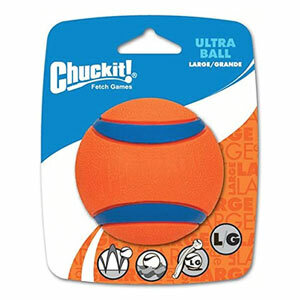 Chuckit Ultra Ball is a hollow natural rubber dog ball that is bouncy, floats, is easy to see, is very durable and light yet tough, virtually indestructible dog ball. 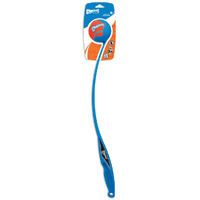 It definitely has the fun factor and has been designed for even the most demanding use. This is certainly no ordinary ball, destined to be binned. Simply put, Chuckit Ultra Ball is the best dog ball ever. 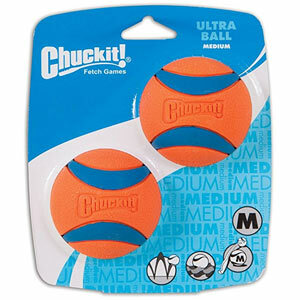 If you think your dog is tough on toys, let them loose on a Chuckit Ultra Ball. 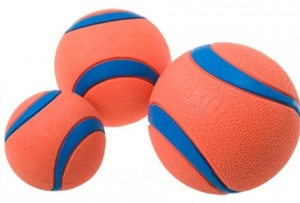 Developed to have high bounce, high buoyancy, high visibility, and high durability, the value of the Ultra Ball is easily recognized by dog owners. It will soon be your dog's favourite toy. And because it endures you will love it too. 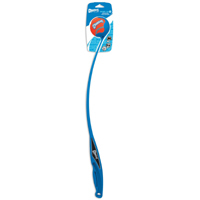 Ball thrower compatible for amazing games of fetch. 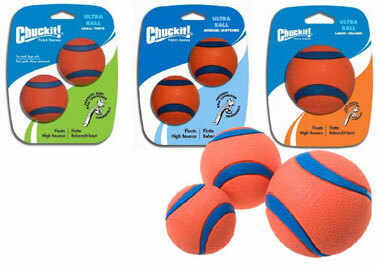 If buying Ultra Ball for a Chuckit ball launcher, please check our size compatibility guide below. These are really bouncy.They are impervious to the teeth of my terrier.Easy to see in the long grass on walks. I am very pleased with them but I suspect my dog would prefer his old tennis balls which can be ripped and shredded (and worry his owner that he was ingesting lumps of fibre and plastic aaargh!). For bounce and visibility I think they are really good.Obviously don't kick them at your dog in case of hurting his teeth but if your dog is a chaser and likes a bit of bounce,try these. I am glad you like them Christina. 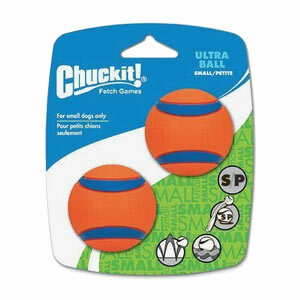 Ultra Ball is hollow and relatively soft so don't worry, it won't hurt your dog's teeth. Found this product excellent it’s taken my Labrador over 3 weeks to see them off. I am about to reorder this product as I am so pleased with it. Our doggy Izzy loves these balls. They are the perfect size for her and they have a great bounce so that even when my throwing skills are having a day off, she can still have a good run! I left my review for a couple of weeks to see how long the ball would last. To my utter amazement after 4 weeks it is still in one piece! If you haven't got one of these balls you should get one. I have a 1yr old German Shepherd who has destroyed all her toys but not this one. You will not be disappointed. Our nervous Collie would not touch the large ball at first Now it is her favourite ball! It is firm, but not too hard, and bounces well. She loves it.